This op-ed was originally published by Apolitical. Despite a common refrain that education is slow to change, there is no shortage of novel and groundbreaking ideas in the sector. Children in Brazil are designing video games to teach each other biology lessons. In Ghana, students are receiving training in self-awareness and resilience even as they complete lessons in typical school subjects. Meanwhile, in South Africa, high school graduates are testing out career paths as project managers and engineers, and getting their post-secondary education funded through a shared education program run by companies and schools. At the Center for Universal Education, we recently completed a global catalog of education innovations as part of our new book, Leapfrogging Inequality: Remaking Education to Help Young People Thrive. The catalog documents almost 3,000 education innovations from 166 countries around the world. The ideas come from both developing and developed countries, are implemented by a variety of actors (non-profits, governments, and the private sector) and range from new and untested to established and backed by evidence. While innovations in education are taking place around the globe, they are not all created equal—different ideas will lead to different outcomes. We argue that the most worthwhile innovations in education are those that have the power to rapidly accelerate progress and help give all children the full set of skills and competencies they need to thrive today and in the future. We believe ideas like these have the power to “leapfrog” education progress. What is leapfrogging in education? The term is not commonly used in the education sector, and is more often employed to reference the rapid and non-linear progress made in telecommunications or banking. In Kenya, for example, the move to mobile banking from more traditional forms doubled the number of people with access to credit in less than four years. This was a leap forward from the previous pace of progress. Making similar exponential progress in education will involve a mindset shift for policymakers. 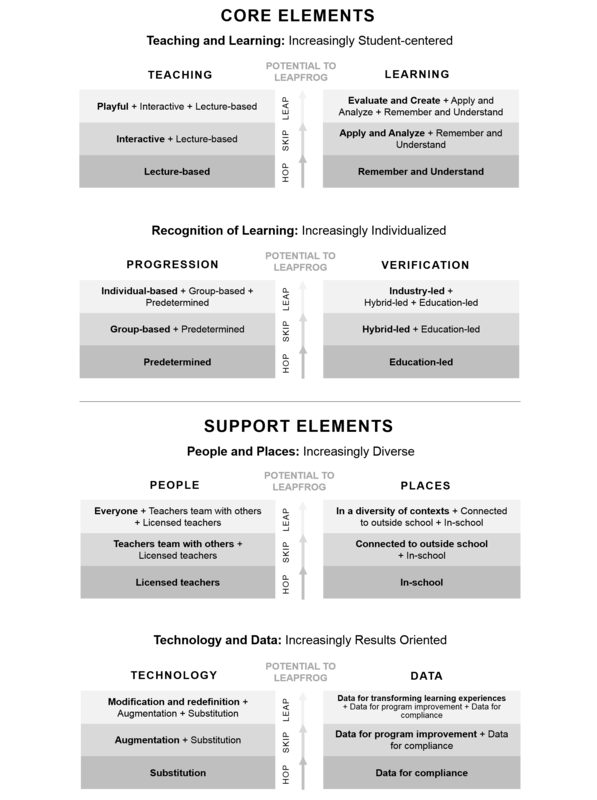 In most countries, mass education systems have been developed in a step-by-step fashion. First, they focus on getting kids into school (access), then they focus on academic achievement (quality) and then they focus on the relevance of what they are teaching for students’ future lives (relevance). We argue that education policymakers have to address all three of these at the same time. Even for children out of school living in the most remote communities, the focus should be on how to help them develop the full breadth of competencies and skills they will need to thrive today—not five or 10 years from now once schools are built and materials are provided. Take, for example, the approach that education leaders serving rural children in Brazil’s Amazon jungle have taken. In a few short years, children who previously only had access to primary school have gained access to secondary education with a curriculum that is specifically adapted to their context, culture and needs. Lessons are delivered via two-way video link with top content specialists lecturing from the region’s capital, supported by classroom management and coaching from mentoring teachers in the community. Innovation is key to education progress. But how, concretely, can policymakers harness its power? After an extensive literature review, interviewing more than 100 thought leaders and analysing thousands of innovations, we have developed a framework, which we call the leapfrog pathway. This has two core elements. First, the teaching and learning experience must be transformed to be increasingly student-centered. Second, the process of recognizing student learning—whether that is through national exams or classroom grades—must follow suit and be increasingly individualized. To support these changes to the teaching and learning experience, policymakers will need to leverage technology. They will also need to diversify the people and places where learning takes place, so that often over-burdened classroom teachers can get effective support from other members of the community, peers, or technology. Education policymakers can use this framework to help assess what types of innovations will have the most potential to transform what and how children learn. Ultimately, if we do not leapfrog in education, half of all youth in the developing world entering society (and the workforce) in 2030 will lack the basic secondary-level skills they need to survive. The risks of trying a new approach are dwarfed by the risks of not finding ways to rapidly help all children develop the skills they need to thrive. This holds equally true for the 30 percent of children in high-income countries, the 50 percent of children in middle-income countries and the 90 percent of children in low-income countries who will not develop necessary skills if we continue with business as usual.